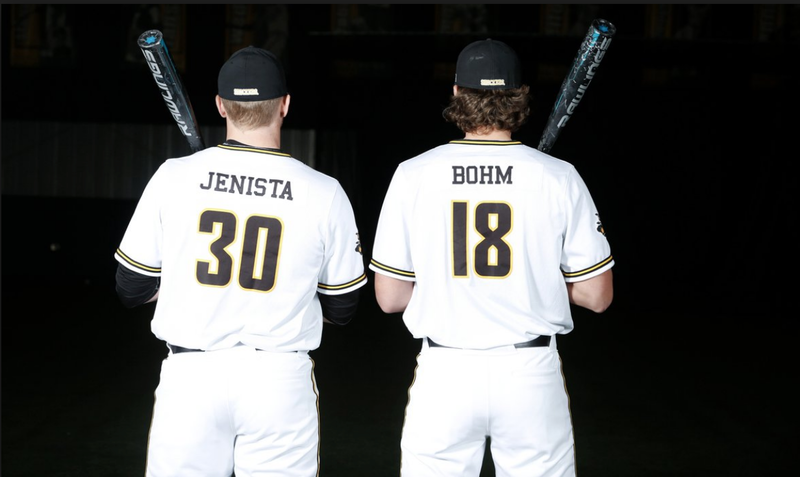 Alec Bohm – The Shockers third baseman’s stock is likely rising out of the Royals range. This college class hasn’t had a lot of players eligible for this draft excel from the start of the season, but Bohm is one of the few, currently hitting .344/.474/.667 with 15 extra base hits including 7 home runs. At 6-5, 220 lbs. and average athletic athleticism, a wise approach and good bat to ball skills, Bohm should be able to hit for a decent average as he advances up levels. While I don’t think he’ll be available where the Royals pick, I would likely pass on drafting him as I think he’ll slow and doesn’t have the arm needed for third, likely leaving him as a first baseman. While Bohm should hit for a solid average and draw walks, I’m also unsure about his bat path being more line-drive oriented currently. With his long arms, he could become vulnerable on the inside and struggle to reach the home run needed to carry first base in the long term. Greyson Jenista – On the other hand there is Bohm’s teammate, Greyson Jenista, who features louder bat speed and more loft in his swing. Not quite possessing the hit tool of his teammate, Jenista plays center now but if drafted by the Royals he would likely need to move to a corner as he doesn’t have the straight-line speed to handle center in Kauffman Stadium. Still, he should become a plus defender with a good enough arm to play rightfield. The loft in the swing along with the bat speed and physical body should project into plus-plus future power, possibly becoming a 30-40 home run future threat. That uphill bat path likely will lead to more swing and miss in the pro game than it has in college (16 K in 24 games), but the power should counter it well enough. On top of Jenista’s excellent career with the Shockers, he was named MVP of the Cape Cod League this past summer after putting up a .792 OPS for Cotuit. The Royals have selected just two college bats in the first round since Dayton Moore’s arrival, and some have questioned whether both (Colon, Dozier) was selected due to their price tag which would make Jenista an out of character pick at 18. Isaiah Campbell – Coming out of Olathe South, the 6-5 right-hander was classified as having an extra large build, meaning he was slightly overweight. That is no longer the case as Campbell has lost ten pounds according to what he was listed at previously, which tells just some of the story as he looks quite a bit stronger with a major league body. His over the top release creates a good downhill plane on his fastball that he runs in the low to mid 90’s, while topping at 97 mph. The arm path is long as one would come to expect from a large pitcher with long levers, but it leads to unrefined control. The slow curveball that he works with is a 12-6 breaker that matches the fastball with downhill movement at a slow pace in the low 70s. The pitch would probably work better in pro ball with more pace if he can keep the downhill movement, but will likely need more break than a rolling motion it possesses currently. In addition to the curve, he tosses a change in the low 80’s with fade and mirroring arm movement. It’s a possible above average future pitch, and his best secondary pitch. A splitter may be the perfect compliment to his arsenal with the downward plane movement on his pitches, something Kansas City typically doesn’t work within their development program. The physical size and frame that hints at durability, but Campbell missed most of 2017 with bone spurs in his elbow and has already encountered inflammation this season. As a draft-eligible sophomore at Arkansas, Campbell has increased leverage, but there are enough red flags here with mechanics and injury history that the Royals should steer clear despite his local background. Blaine Knight – Knight has developed a penchant for defeating higher profile starting pitchers this season, leading his Razorbacks to wins over Florida’s Brady Singer, Mississippi’s Ryan Rolison and Kentucky’s Sean Hjelle already this season. The right-hander works from a lower 3/4 arm slot with arm side run that he has commanded well throughout his Arkansas career, walking just over 2 per 9 with that fastball while backing it up with his slider. He efficiently attacks the zone, keeping the ball low while breaking off his slider away from right-handed hitters or buckling their knees on the inside. Always on the attack with his 91-93 mph fastball that he can run up to 96 mph, Knight has given up the occasional home run, allowing 16 in his last 131 innings, but he’s mitigated damage without the free pass and a 4/1 K:BB ratio. In addition to his mid 80s slider, Knight works with a changeup against lefties that features some downward movement. Primarily he works with the fastball-slider combo though and will need to concentrate on his arm speed with the pitch, perhaps increasing the arm side fade if possible. The highly successful college arm uses a curve to give his stuff a different look, but like Campbell’s, it’s of the rolling variety instead of a two-plane dropper. Overall the stuff plays up thanks to solid mechanics that keeps the ball hidden well behind a tucked shoulder and an attacking mentality. The slider is above average currently but will need to take another tick up, as well as a needed improvement in his changeup to reach his peak, but should that not happen he should fit safely in the backend of a bullpen. There are enough questions there that picking him at 18 wouldn’t be a smart play, but any pick the Royals have from 33 to 58 would make plenty of sense for Knight. Recap: Jake Junis is Good!